This table topper made hardly a dint in the blues. The logs are cut much smaller than I normally cut for scrap storage. My normal cuts are 5", 2 1/2" and 1 1/2". I leave those in strips and box similar colours together. I had to use untrimmed chunks for this assignment. The pattern is called Log cabin Twist and this is just one of a few variations illustrated in the pattern. Over this past month I have been trying to tidy up a little as the sewing room has managed to get out of control. I am inching closer to some level of organization. But it is an ongoing battle. Once again the Fat Quarter Shop has organized a charity focussed Quilt Along. 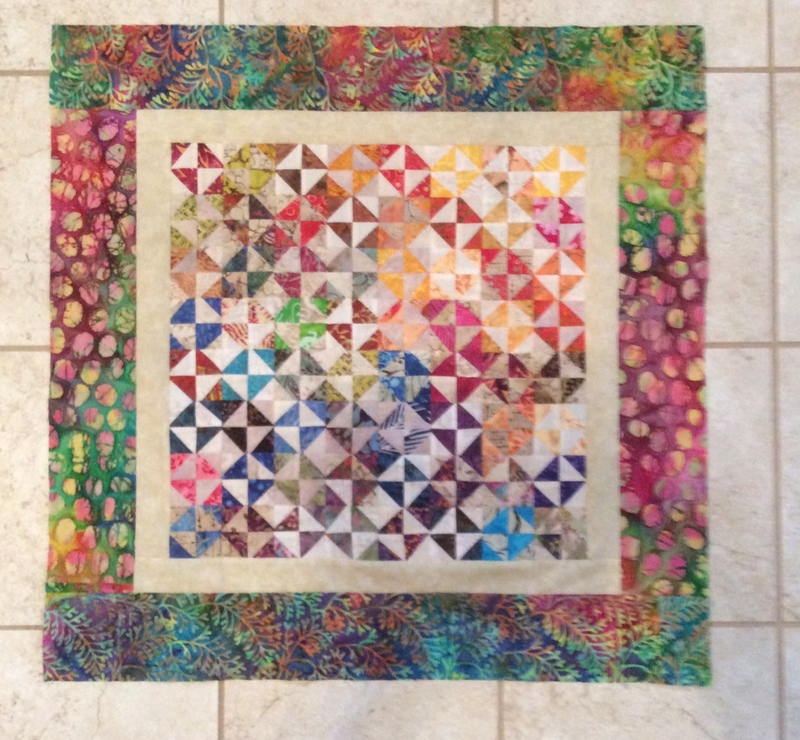 The quilt is called Clementine and the feature fabric is Mama's Cottage by April Rosenthal. The kits were a little late in shipping and mine have to cross the border so as a result I was a little late starting. The block for Month One is called Watermelon Wheel. 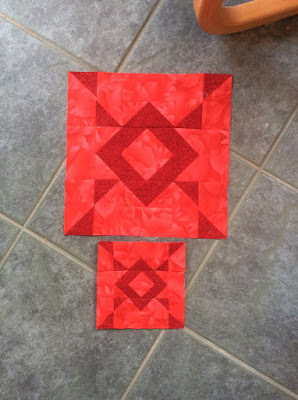 Each month we will be making a large (20" block) and a small (12" block). The fabric selected for the kits was Mama's Cottage by April Rosenthal, a delightful breath of fresh air for we sun and warmth starved Ontario residents. There are bloggers and designers from many locations participating in this Quilt Along. To obtain your own copy of the pattern the Fat Quarter Shop requests a voluntary donation to St. Jude's Children's Hospital. The pattern itself is crisply written and well illustrated. This is the list of participating bloggers. Please try to visit a few as even though we are all doing the same thing it will have little variations here and there. 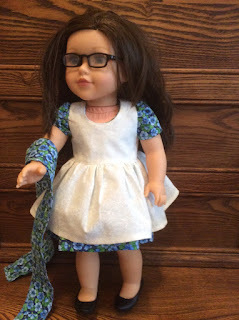 I was able to finish these two outfits for the Oh Sew Kat Doll Clothes Blog Hop. I can't begin to tell you just how much fun I had working on these two little outfits. The Sugar and Spice outfit on the left comes with a dress pattern and what I call a pinafore. Some would call it a sleeveless dress. The instructions were so clear and I really liked the way they came with their own checklist to help you keep track of where you were. (Especially handy for people who get many interruptions while sewing). I added the scarf because the doll owner's Grandma, who has a far better developed fashion sense than I do, suggested it would be a good accessory. The Grandma also told me that pink was a favourite colour so I made the Bloomer Buddies dress in a pink stripe with a plain pink yoke. 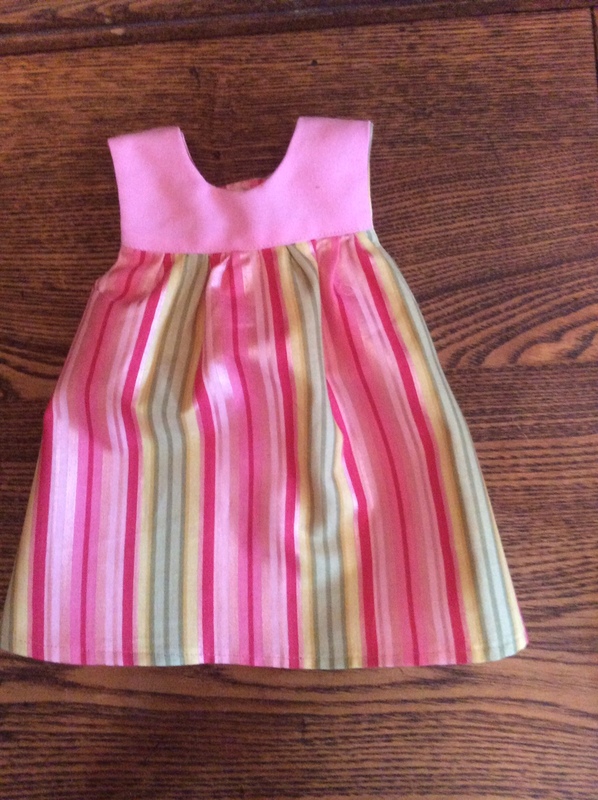 Both patterns require some basic sewing skills but the size makes them much easier to sew than Barbie clothes. Here I am with the happy recipient. 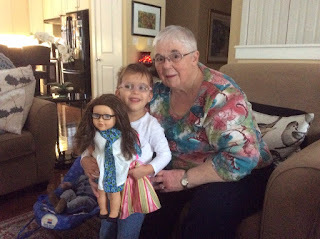 Ivy loaned me her doll so I could tell if the clothes fit and in return she now has two new outfits for her doll. I helped her with the velcro on one and she was good to go on the velcro with the second one. Note that we are all wearing glasses. I was surprised but pleased to see glasses on Ivy's doll. Accessories for dolls have changed in the past 30+ years since I had anyone around me who played with dolls. Ivy has been wearing glasses since she was an infant. I would love to make more of these outfits and if Ivy's reaction was any indication they would be popular. If you have not had a chance to visit some of the other blog stops here is an updated list. Who said Waste Triangles are garbage? Not I for sure. 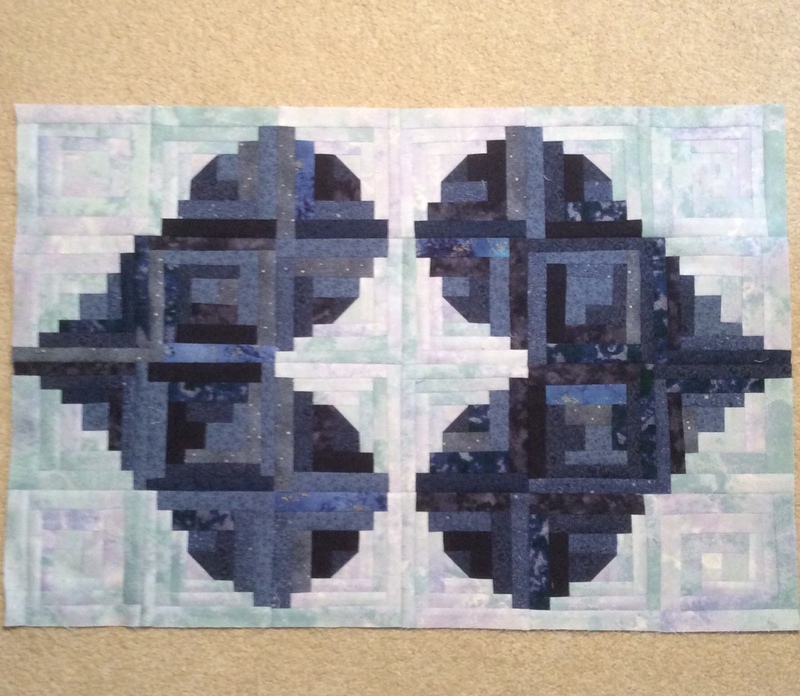 This small quilt is 29" square. Each Half Square Triangle finishes at 1 1/8". I was at two retreats last fall and at both of them friends were throwing away their Waste Triangles. I couldn't let that happen. So they would bring them to me in installments and one just stuffed her's in a baggie and dropped the baggie off. I had a lot of fun playing with them and trying to make them into something useful. 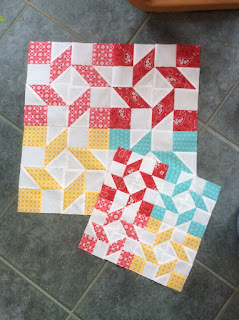 with the borders on them they are now big enough for the small Project Linus quilts. As to what else I have been doing. It is a lot of secret sewing. that phrase used to drive me nuts but I totally understand it now. Oh Sew Kat Doll Clothes Blog Tour hosted by Seams Sew Lo. My day is next week. 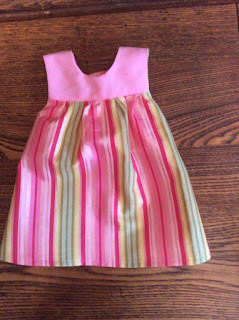 I had a lot of fun making some doll clothes. A definite change of pace. Check out some of the other participants over the next little while. Welcome to the Oh Sew Kat Doll Clothes Blog Tour hosted by Seams Sew Lo!! Oh Sew Kat has so many doll clothes options. As we head into a new year mnay bloggers and some Instagram people offer new challenges for us to follow. One I intend to follow is the Month Colour Challenge (note Canadian spelling) offered by Jen from Patterns by Jen (here). 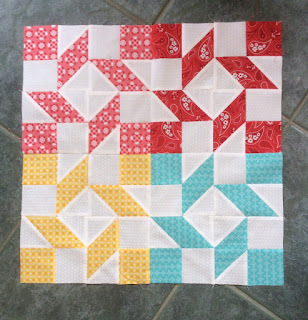 I have tested quilt patterns for Jen for a couple of years and I love how she takes something basic and accessible, gives it a little twist to step it up a notch and creates a great design. For 2018 she is offering on her blog a month colour challenge. Each month she will provide a different quilt block in both 12" and 6" sizes in the colour of the month. I have seen the blocks and they are original and interesting. I encourage you to follow along. Jen is being joined by some other bloggers for this project. Some like myself will just make the monthly project while others will enrich the experience by adding something via their blogs. I "borrowed" the links from sherrie at Powered by Quilting. she is adding a second block each month. These blocks will be free for the month they are offered and then available for a small fee. And now for my January blocks.